Made from Solid Cedar Wood for a top of the range timber door. On retractable gear as standard , allowing the door to be automated . Steel frame in RAL 8017 comes as standard on this model . Choose your finish - either base coated or fully finished in a range of colours . This model comes with a brown steel frame factory assembled making it very easy to install the frame Adds 60mm per side on the width and 60mm across the top .. If your doors are to be fitted side by side just let us know and we will hand select each piece of timber to create a close matching pair and colour to a similar shade , Remember wood is a natural product and no two doors can be identical !. We deliver most doors on our own transport, average delivery time on a timber door is 4-6 weeks. 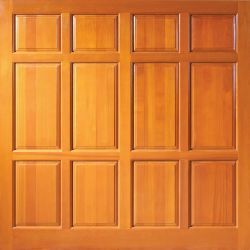 Due to that fact theses doors are not stocked items at the factory, All timber door are hand made at the point of ordering to your Specification.